The speaker of Spain’s Congress, Ana Pastor, expelled Catalan MP Gabriel Rufián from the chamber on Wednesday after his confrontation with the Spanish Foreign Minister Josep Borrell. The row follows days of rising tension in the Spanish parliament between unionist and pro-independence groups, as well as left and right wing parties. 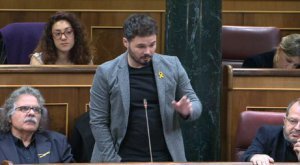 Gabriel Rufián started his remarks by saying his parliamentary group, Esquerra (ERC), will define anyone calling them ‘participants of a coup d’état’ as ‘fascist’. Borrell thought Rufián had called him a ‘racist’ and urged the speaker to delete the insults from the minutes of the session. The speaker said she would comment on that afterwards but let the Catalan MP go ahead. Rufián went on to define Borrell as the ‘most disgraceful minister in the history of democracy’. ‘You are not a minister, you are a hooligan, a militant of Societat Civil Catalana, an embarrassment for your parliamentary group, because this is a far-right organisation,’ he said. The pro-independence MP accused Borrell of a lack of respect towards the ERC leader, Oriol Junqueras, who has been in pre-trial jail for more than a year. ‘You mocked Oriol Junqueras while he was rotting in a Madrid prison. I urge you to stand down,’ Rufián said. He was referring to comments by Borrell during a campaign event when it was reported that he had described the ERC leader as ‘imprisoned father Junqueras’, saying that he had the ‘same physical and mental structure’ as his town pastor. ‘You only offer a mix of dung and sawdust to this chamber,’ minister Borrell replied to Rufián. All the Socialist (PSOE) MPs stood up to applaud him, as also did some members of Ciudadanos (Cs) and the People’s Party (PP), to which Rufián reacted by also standing up and pointing at the cross-party unity arrayed against him. This prompted the chamber speaker to call him to order. After three warnings, she expelled him, and his entire parliamentary group abandoned the chamber with him. While they were leaving the plenary, Borrell insinuated that one of them had spat at him, something that the ERC MPs denied. Following the row, speaker Ana Pastor condemned the attitude of MPs in the chamber and said that she would not tolerate it anymore. She added that accusations of ‘fascism’ and ‘coup d’états’ will be deleted from the minutes of the session. Pastor also regretted ‘sexist’ comments seen in the press that portray her as a ‘governess’. ‘I won’t tolerate any more things such as those that we saw here today,’ she added.